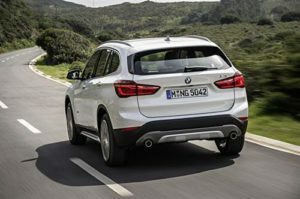 The new BMW X1 SUV is cheaper to run than last time, fun to drive, and remains very usable to families who are on the lookout for a smart, compact and practical 4 x 4. And in a bold move, the entry-level models have swapped the rear-wheel-drive system for a front-wheel one. It’s also a stylish car that’s not really any bigger than the Ford Focus but, unlike last time around, has shed its hatchback pretensions to look like a fully fledged, brawny SUV that’s got your back. It’s a bit taller, which improves visibility, but it’s not as heavy as proper SUV. This means it handles well, and is fairly nimble. As far as premium large family cars go, it ticks a lot of boxes. OSV takes a closer look at what it’s all about with our BMW X1 SUV review. The new X1 drives considerably differently to the one it replaces. Whereas the outgoing X1 was essentially the BMW 3 Series Touring Estate, the new one has been brought up to date and shares its platform with the new MINI Hatchback. As that probably suggests, the X1 is fun to drive. It’s nippily, agile, and can offer accurate steering. Body lean, meanwhile, is at a minimum, while a 6-speed manual ‘box is standard across the range. If you prefer the 8-sped Steptronic automatic transmission, you can pay a bit extra for it depending on the model you go for. It’s a responsive gearbox that suits the car well, but Sport mode causes a fair bit of jerkiness. There is only one petrol engine in the range, a 2.0-litre xDrive 20i that powers the X1 model. Unusually for a BMW (but not for an xDrive), it comes with four-wheel-drive and can deliver up to 189bhp. That’s enough to get you from a standstill to 62mph in around 7.4 seconds – a very impressive number for a car of this weighting. It isn’t super economical, though, so we recommend it mostly to anyone who plans to do most of their driving in the town. There are a couple of diesel engines that complete the range. The xDrive25d model is backed by a brawny 228bhp engine that comes with a four-wheel-drive system, and delivers most of its punch at low revs. As you put your foot down, it gets louder and has enough thrust in its tank to do the 0-62mph sprint in just 6.6 seconds before maxing out at 146mph. Our pick of the range is the 188bhp diesel that runs the xDrive20d model. It will prove the most popular with buyers thanks to good fuel economy and more-than-satisfactory performance. And thanks to the four-wheel-drive system, it’s also competent off-road, too. It’s not you’d call slow either, and can take care of 0-62mph in 7.6 seconds. 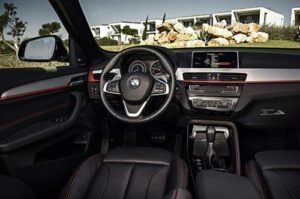 This is a BMW X1 Estate, so the interior was always going to be well-crafted. A logical layout makes it easy to get used to the controls and how they work, while the materials are al of all of a high quality. As mentioned, visibility is good thanks to a taller height than most hatchback’s, while the suspension assures comfort thanks to its uncanny ability to absorb even the UK’s worst road surfaces. However, the option adaptive dampers are still worth adding. The controls on the dashboard are all angled towards you for ease-of-use, while a 6” infotainment screen is standard on all cars. So, too, is the brand’s highly-praised iDrive dial, which was recently upgraded. The X1 is classed as an SUV, so it needs to be spacious. Leg and headroom is good for rear seated passengers, while a sliding rear seat – available as an optional extra – adds even more room. Overall, this new X1 can offer 37mm increased legroom to last time around. The boot is also bigger – some 85-litres bigger, which gives a total measurement of 505-litres. Fold the rear seats down and you get 1,550-litres, which makes boot capacity competitive with rivals. Each door comes with a bin capable of holding a small bottle, while cup holders and a decent-sized glovebox are among the storage spaces. The X1 is well equipped, no matter which variant you go for. The entry-level model boasts sat nav, a powered tail gate and 17” alloys among its standard kit, while the Sport model adds bigger alloys and sports seats. 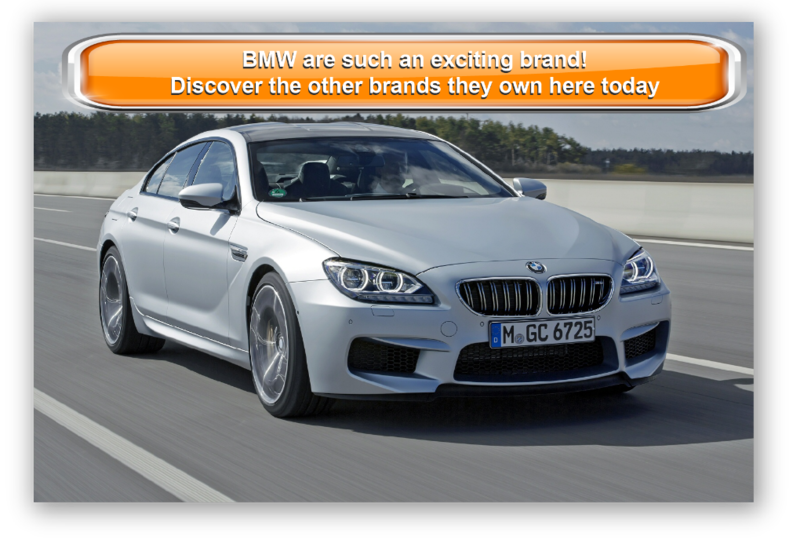 xLine treats you to leather upholstery and LED headlights, while the M Sport model gets racier features, such as sports suspension and an aerodynamic body kit. Useful optional extras include a sliding rear seat, a panoramic sunroof and a flat-folding front passenger seat, while niceties such as different dash colours and interior upholstery can bring your X1 to life a bit more. 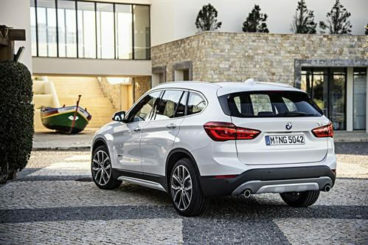 Prices for the new BMW X1 Estate start out from £27,900 and rise to £37,100. For more information on our leasing and BMW X1 finance deals, you can check out our page here. This is a premium car, but efficiency and economy is good. However, had the brand fitted it with more advanced tech of the kind you’ll find in the new Range Rover Evoque, it could have been even better. There are a number of 2.0-litre engines in the range, and how much they’ll cost you to run vary quite wildly. The cheapest to run is the sDrive18d that can average fuel economy returns of 68.9mpg while costing just £20 a year in road tax. It’s really once you start looking at the four-wheel-drive models that things get pretty pricey. The xDrive18d does well to return 60.1mpg, but the xDrive25d returns 55.4mpg at best, and costs £130 a year in road tax. It looks less like a hatchback than its predecessor, but is still not much bigger. This means it remains a sharp handler. It costs a fair bit outright, but high-mileage drivers will save cash in the long-run. Last time around, it looked a bit too much like a hatchback. Now it looks like a proper SUV. It comes with hill descent control, but the X1 isn’t meant to stray too far from the beaten track. Premium crossovers certainly don’t come cheap. Let’s see how the car fares against its rivals in the comparison section of our BMW X1 SUV review. 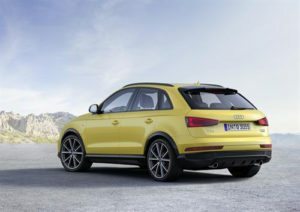 Like the BMW, the new Audi Q3 Estate has plenty of badge appeal, which means that resale values will be strong. For you in the here and now, it’s good to drive, classy, and boasts an upmarket interior. The Q3’s body sits higher than a hatchback, but body lean in bends is minimal. If you opt for a four-wheel-drive model you’ll benefit from lots of grip, though even two-wheel-drive models grip well. The steering is nicely weighted, and the compact size of the car contributes to a good driving experience. All engines in the range offer good performance. If it’s a balance between performance and economy you’re looking for, the 2.0-litre 181bhp diesel power plant is your best bet. You can only get it with four-wheel-drive, and it can do the 0-62mph dash in just 7.9 seconds. Meanwhile, it can achieve average fuel economy returns of 53.3mpg. It’s also super quiet. There are a handful of petrol engines to choose from too, including a smooth and powerful 1.4-litre turbo that’s economical and quick. When paired up with the automatic gearbox, it can get you from rest to 62mph in 8.9 seconds. A four-wheel-drive 2.0-litre petrol engine does the same distance in 7.6 seconds, but for ultimate performance you’d need to splash the cash on the RS Q3. It delivers up to 335bhp, and uses its 2.5-litre five-pot engine to gun you from rest to 62mph in 4.8 seconds. Fuel economy is decent across the range. The 1.4-litre turbo petrol isn’t all that much more expensive to run than the diesel engine, and can average fuel economy returns of 51.4mpg if you don’t push it too hard. You will, however, have to fork out £110 a year in road tax. As always with any Audi, the Q3 SUV’s interior is a beautiful affair. It’s spacious and the German brand have been generous with standard kit. Soft-touch plastics abound, while the controls for the likes of the stereo are exquisite. The interior is well-guarded from exterior noises, but the Q3 does miss out on the very latest VW Group tech. As such, it’s classy but not cutting edge for 2017. Practicality is hit and miss. Overall, this car isn’t much bigger than the VW Golf, but Audi have made it more usable. A high roofline means headroom is good, while the large windows brighten things up. Excellent storage space includes huge rear door bins (probably the biggest in this class! ), while the 420-litre boot is competitive with the X1’s. Its square shape makes it user friendly. 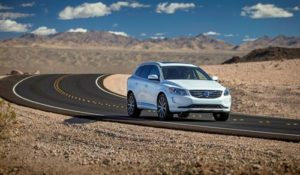 The new Volvo CX60 SUV is an attractive alternative to the usual big guns in this competitive sector. It’s just as premium as the BMW, but comes with less showy looks. “Solid and safe,” is how people have been pretty much describing every aspect of a Volvo since its humble beginnings. And there really is no better way to describe the XC60’s driving experience. Less entertaining than the X1, it’s the steering that really lets it down – it’s heavy but it feels awfully artificial. Worse still, it’s actually really hard to judge when you’re about to lose grip, a problem made word it you opt for a two-wheel-drive model. The 2.0-litre D4 diesel engine is our top pick. It makes economical sense, but that doesn’t detect from performance and it’s got enough thrust in its tank to get you from a rest to 62mph in 8.1 seconds. It’s also quiet and smooth. If, however, you want four-wheel-drive, a more powerful option would be the pricier D4 2.4-litre engine that has more grip but less speed. It’s a decent off-road companion, where it can deal with mud tracks and slippery roads will relative ease. However, don’t expect it to get you out of every tricky situation imaginable, as its off-road prowess isn’t that good. A 2.0-litre T5 petrol engine rounds off the range. It’s quick and can do 0-62 in just 7.2 seconds, and delivers up to 242bhp. As always, the Volvo is comfortable. The seats are super supportive (perhaps the most supportive seats we’ve tried for a long time), while very few external noises make it into the cabin. The steering wheel and driver’s seat are adjustable, and visibility is good. The dash looks contemporary enough, and the buttons are all well-laid out. Volvo have used a lot of top quality plastics here, which makes the interior a pleasant place to spend your time. The brand’s floaty dashboard makes an appearance, giving the cabin a fresh, modern look. Volvo’s are not as practical as they once were. So while there is a good amount of interior space for five adults, there are a few criticism which means the Volvo misses out on an A in this area. For example, the 495-litre boot is far from class-leading, while you can’t specify the car with seven seats. However, it makes for a good tower, and can tow weight up to 2,000kg. If you’re a BMW purist, you’ll no doubt want to avoid the entry-level model which comes with front-wheel-drive as opposed to rear-wheel. Apart from that, the new X1 is an excellent premium crossover that boast sharp handling, cheap to run engines, and much better styling. The similarities with the outgoing X1 are scant – and this is a good thing. Now much more of an SUV than a wimpy hatchback, the BMW X1 SUV is taller, brawnier, and more useful.